The latest entry in the Galapagos RPG brand. 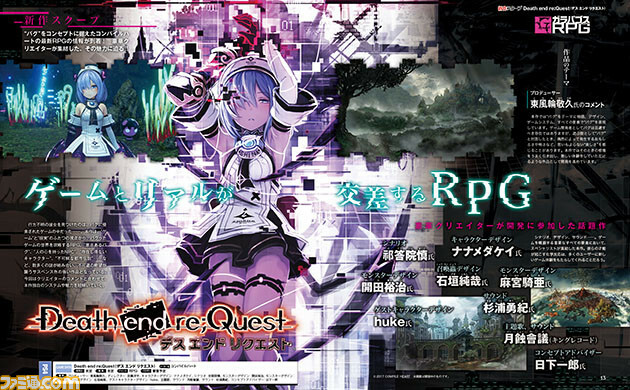 Following a teaser website last week, Compile Heart has announced Death end re;Quest for PlayStation 4, an “RPG where game and reality intersect,” in the latest issue of Weekly Famitsu. Death end re;Quest is the latest entry in Compile Heart’s Galapagos RPG brand of titles, which includes Fairy Fencer F, Omega Quintet, and Fairy Fencer F: Advent Dark Force. Update 6:50 a.m.: The game tasks players with clearing a bugged game world from the perspectives of both game and reality. Many mysteries will intertwine, including bugs with will, NPCs with human hearts, and characters who cannot exist. The protagonist, a programmer named Arata Mizunashi, receives an e-mail from Shiina Ninomiya, who has been missing for the past year. In order to save Shiina from “World Odyssey,” a virtual reality MMORPG that ceased development and from which she cannot log out, Arata takes action. Battles are turn-based command battles. You can evade attacks and perform counterattacks, and there is also a knock back system to blow back enemies. It is also possible to install game systems from reality to add genres to the battle and increase your strategies. There is also an element where staying in the game too long causes your body to be contaminated by bugs and your style to change, and becoming over-contaminated leads to death. Update 7:50 a.m.: Release date and price are currently to be announced. Development is currently 51 percent complete.